The Partridges return from a singing engagement, and find songwriter Bobby Conway living in their garage! • This episode was the pilot for the series, "Getting Together." Created and written by Bernard Slade, it aired on ABC from September 18, 1971 to January 8, 1972. It also starred Pat Carroll, Jack Burns and Susan Neher. Bernard Slade also wrote Episodes 1, 3, 5, 8, 13, 17, 36, and 38. To read our exclusive interview with Bernard Slade, visit the People and Places section of the website! • "Stephanie" is the same song as "All Of The Things" (Episode 9) but with different lyrics. Bobby Sherman starts off singing the song, as the scene segues into the Partridge Family performing it on stage. Complete versions exist of the song, although it has never been released on a commercial LP. • During the summer hiatus, "I'll Meet You Halfway" was released. 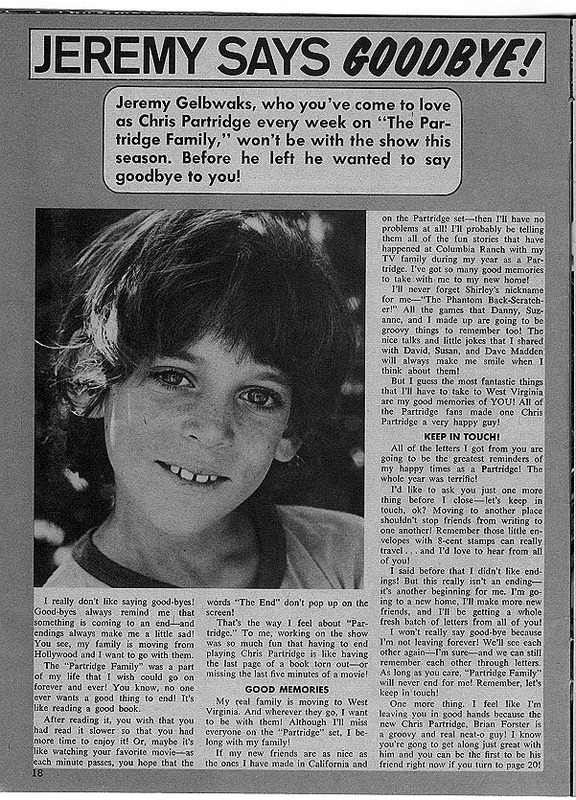 It was The Partridge Family's third single, peaking at #9 in June, 1971. At first, Wes Farrell had considered releasing "Morning Rider On The Road" instead (a song Tony Romeo had originally written for Glen Campbell). Strangely, "Morning Rider On The Road" was never used in an episode. • While the series was on hiatus, Wes Farrell and the Partridge Family musicians and singers reunite in the studio to start working on songs for "Sound Magazine." The album is released in July. It hits #9 on the charts in September. In August, they start working on "A Partridge Family Christmas Card." • "I Woke Up In Love This Morning" was the Partridge Family's fourth hit single, rising to #13 on the Billboard charts, on August 21, 1971. • By the end of the first season, the series was a bonafide hit, record albums were racking up incredible sales, and a truck load of Partridge Family product began flooding the store shelves. Tiger Beat magazine began publishing the "Official Partridge Family Magazine" and David Cassidy became the nation's #1 teen idol. This was just the beginning of an incredible four-year ride! Fun episode and the pilot for what I thought was a cute series. I wonder if Sony left the tag off of this on the DVD's because it is a lead in to the Getting Together series and they have no plans to release it? I wish they would. I liked Bobby Sherman in the day almost as much as David Cassidy. The biggest continuity error is in the "Stephanie" song since the melody is the same as "all of the Things" heard earlier in the season there is no way that Bobby Conaway could have written in basically he plagarized Keith Partridge. Sloppy on the writier's part since there are plenty of tunes that were not used that could have been introduced here instead. I can't believe that we are already through the fiirst season of watching, It's been fun and hope to enjoy sharing second season with you all just as much. I would love it if the series Getting Togeather were available to watch..... maybe someday on the web like on Hulu or something like that. Good show, great season and I was hooked for the duration!!! When the music starts, the Glen Glenn Sound shouts out "ONE or WHAT" when the knight in shining armor (Wes Stern) comes out!! I was laughing when Wes said "Turn on stove"! Hmmm, here in Australia only the first two seasons of the show have been released at this stage and it looks as though that could be it. (and don't worry I already imported Seasons 3 and 4)! However, whilst the packaging and artwork is replicated by Sony for release here, we DID actually get the tag segment that was edited out for you Statesiders. It is defintitely intact on our version. The Tube Trivia synopsis says Lionel (or is that Llionel?) lives in Denver, but that's never specified in the episode. I wonder where that came from? I loved this episode even before I realized it was a pilot for a spinoff. So many of the first-season episodes focused on other characters and situations. Looking back, I think The Red Woodloe Story and Soul Club (and even Road Song) could both have been possible spinoff ideas. I've always been a spinoff fanatic, so the thought that they were spinning off something from the PF was quite exciting to me when I realized that's what was happening. I remember seeing the first promo for Getting Together and being almost speechless. "Hey! Those are the guys from The Partridge Family!!!" Bobby steals milk in the opening scene (we only see his feet). He tells the family he was going to record some tapes and leave them, because they were away. When the family is awaken by loud music, they investigate. On their way out to the garage they pass by the bus.If Bobby was ‘living in their garage’ didn’t hear here them pull up? Even if he wasn’t nearby when they got home…he should’ve seen the bus when he got back. It’s hard to miss. It's been a year since the last post. Are we moving on to season 2? I just noticed wikipedia mentions Ep. 25 has an epilogue. "None of the U.S. DVD releases contain the epilogue to episode #25..." Does anyone remember what happened at the end of the original version? I'm curious! I have the epilog on a VHS tape. Basically, the Partridges say goodbye to Bobby and Lionel as they drive off together and Reuben comments about how they are going to be quite a team. or something like that. I think you can find this as a clip on You Tube. also.